St. Vincent de Paul: Santa Clara County	» Blog Archive » Bingo & Pasta Fundraiser- A Huge Success! Bingo & Pasta Fundraiser- A Huge Success! Father Mendie Calls out the numbers! 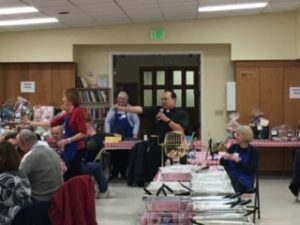 On February 23rd at St. Simon Parish in Los Altos St. Vincent de Paul wrapped up our 2nd Annual Bingo & Pasta Fundraiser. This year we sold out and had a great time! All had fun playing bingo, conversing, catching up with old friends and making new friends over a catered meal from the Olive Garden. We were able to raise much needed funds to help us in our effort to continue to help those in need. We wish to thank all those who attended, the volunteers who diligently made sure all were taken care of, and Father Mendie who ran the Bingo game and kept us all entertained. A special thanks to Rose Mary Becker, our council president, who’s planing and coordination made this event a huge success. We hope to see more of you next year!